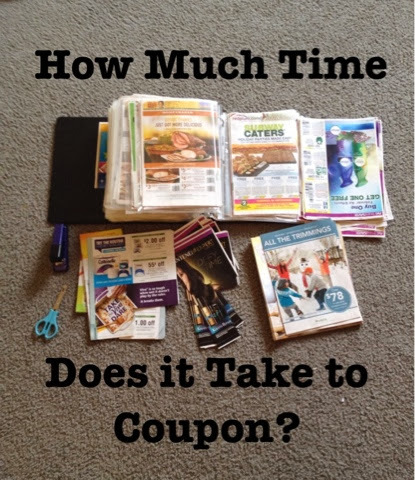 How Much Time Does it Take to Coupon? 1. Spend 30 minutes to an hour each day looking for deals. I look through deal threads via social media, blogs or coupon groups on my iphone everyday. When I see a deal I want to do I copy it and paste it on “notepad” for iPhone. You can save it anywhere that works for you. I do this because I only devote one day a week to gathering the coupons I need to shop. Check out: How to make extra money for couponing. 2. Spend 1-2 hours locating and organizing the coupons for your shopping trip. On Thursday evenings or Friday mornings I go through the deals on my notepad and gather the coupons for them. Choose the day that works best for you. Having a specific day cultivates disciplined couponing and prevents couponing from becoming an addictive hobby. Check out: What you can get for FREE today. 3. Shop 1-2 times per week. I shop 1-2 times per week unless I see a “run deal” or “free stock up deal”. Run Deal – A run deal is one of those deals where the odds of scoring it diminishes by the hour as more and more people hear about it. Here’s an example of the run deal (link to Viva or Kleenex). Free Stock Up Deal – A deal where I can get a large quantity of things I need for free (link to Walmart Glade Haul). 4. Organize Your Coupons no less than once per month. Keeping my coupon binders and accordion file organized helps reduce the time it takes to get in on great deals. I always know where my coupons are with the filing method I use. I won’t talk about my method in this post but will create a post soon. I can’t tell you an exact amount of time I spend each week couponing but it’s not enough to take away from my role as wife and mom of 4. I run two blogs, my own business, work out 2-3 hours a day, coupon, cook meals from scratch and spend and insane amount for family time with my husband and children. Couponing is a natural part of my life. I do something related to coupons daily just like I check my bank account, cook and workout daily. It’s a part of my normal life but doesn’t take over my normal life. It’s about balance and prioritizing what’s important. Previous Post How Much Time Does it Take to Coupon? Next Post Finish Dishwasher tabs | FREE + Money Maker! !